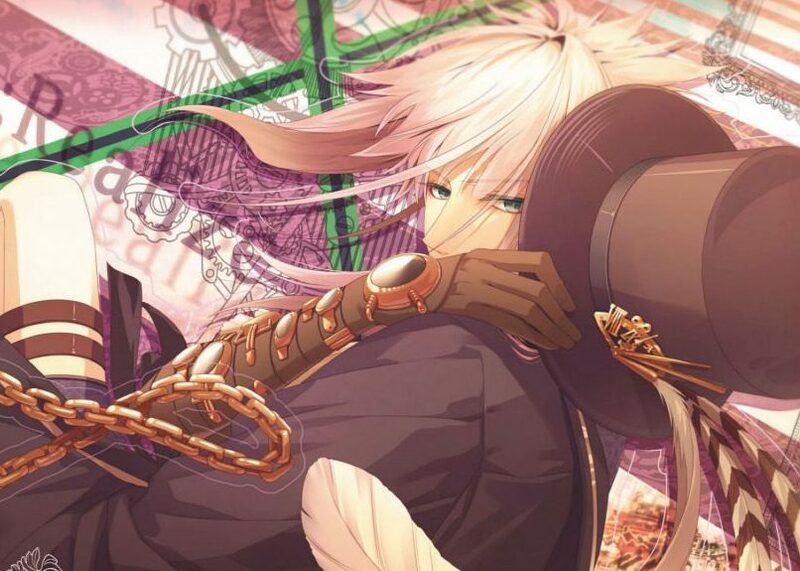 My authentication guide has earned a lot of praise (and haters) and I want to take some time to remind you all that this guide is purely compiled from my personal observation, thoughts and experience. Whilst I endeavour to keep the information up to date and correct, I make no representation or warranties of any kind about the completeness, accuracy and reliability contained on the guide. Any reliance you place on such information is therefore strictly at your own risk. When I wrote this guide, I felt that only Rilakkuma plushies made by San-X are considered “real/authentic” (as these are the only plushies I’d ever collect), but there are actually quite a few OTHER companies who have the licence to produce Rilakkuma goods (so in theory, these are not “fakes/counterfeits” since they are legally allowed to produce them). These usually look different from the official San-X goods. You can read more about it here. My good friend – RilakkumaLifestyle was kind enough to put in time and effort to write that guide, so please make sure you visit her blog too! Today I went to visit an asian store in Newmarket called Osia. 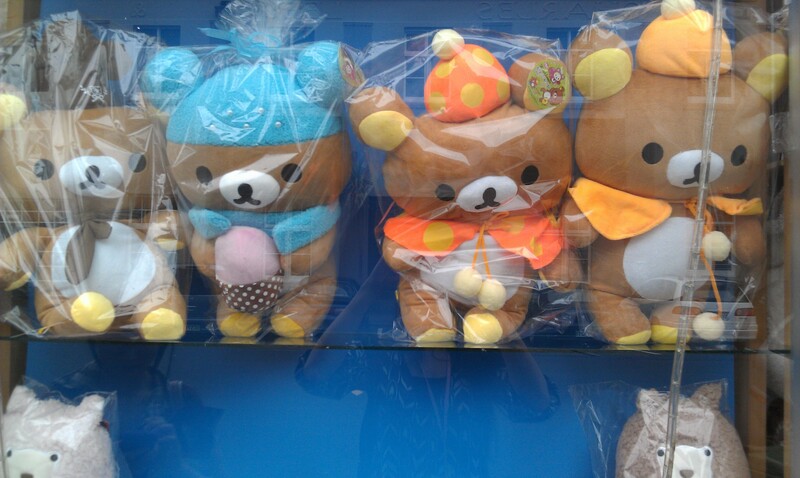 I’ve previously noted from its display window a lot of Rilakkuma plushies. The price for the plushies were reasonable ranging from $30 to $60NZD, but on closer inspection I realised they were all fakes! This is really sad. Just like Louis Vuitton (I’m a fan and collector of Louis Vuitton too ^-^) the world of Rilakkuma is brimming with fakes! 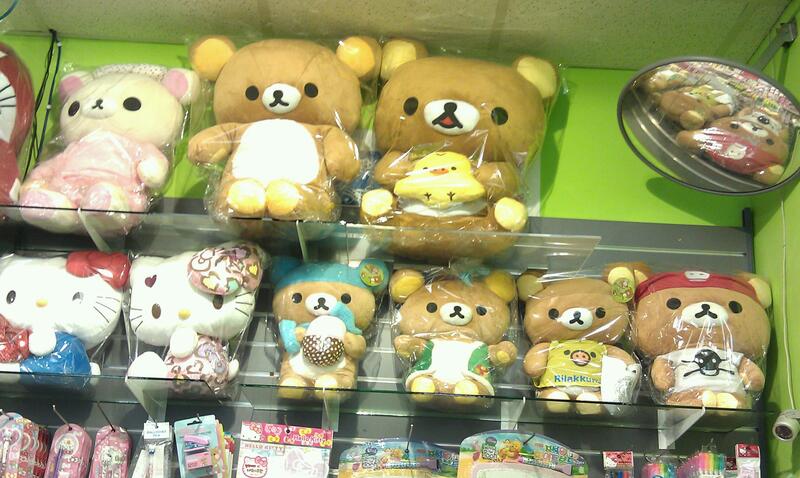 In fact, I haven’t seen a shop in Auckland that sells authentic Rilakkuma products. Here are some photos from Osia Judy and I managed to sneak in. Sorry for the poor quality – we didn’t want to get caught by the shopkeeper. Fake limited Bonjour plush on the top. Wrong sizing, wrong scarf, wrong colours, wrong material. A picture of the authentic one shown on the bottom for comparison. Look at how big the Honeybee plush is on the right – so wrong. Some fakes are very very OBVIOUS! I reckon the worst of all is that all of these fakes are selling at the same or higher prices than the genuine ones! And all the sellers claim they are genuine San-x products. Little liars. I myself was a victim of such fraud. My first Rilakkuma plushies were from an E-bay seller, I bought each for about $40NZD. They were both fakes from Korea. 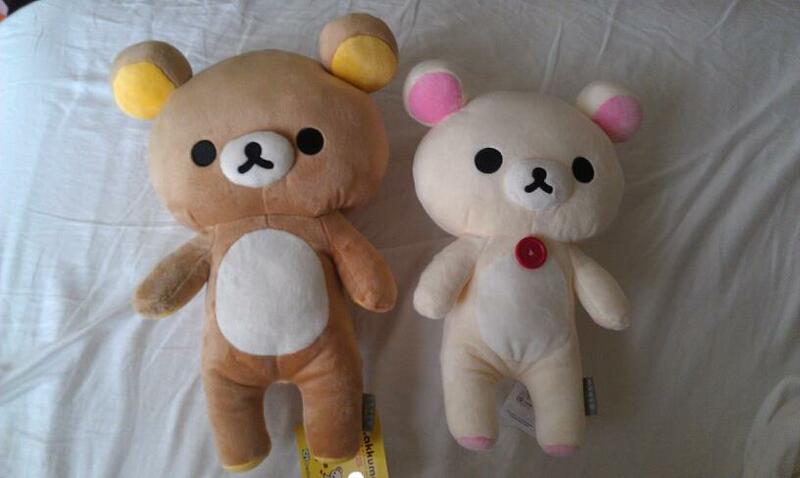 My first Rilakkuma plushies – both fakes >.< so sad! Most of the time it’s very easy to tell a fake from a genuine plushie – the fake ones are usually made from cheaper materials, look asymmetrical, look ‘off’ or feature a design/theme San-x has never released. But some, such as the ones in Osia, can be tricky to rattle out. I find with these, inspecting the tags and labels can be very helpful. 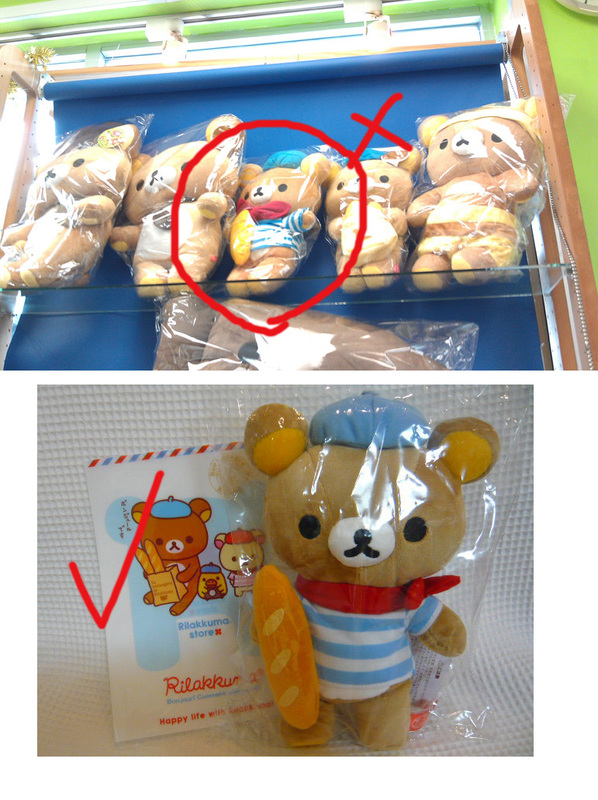 I’ve compiled below a quick guide on distinguishing fake from genuine rilakkuma plushies. They took me a while to do, I hope you’ve found them somewhat useful haha. 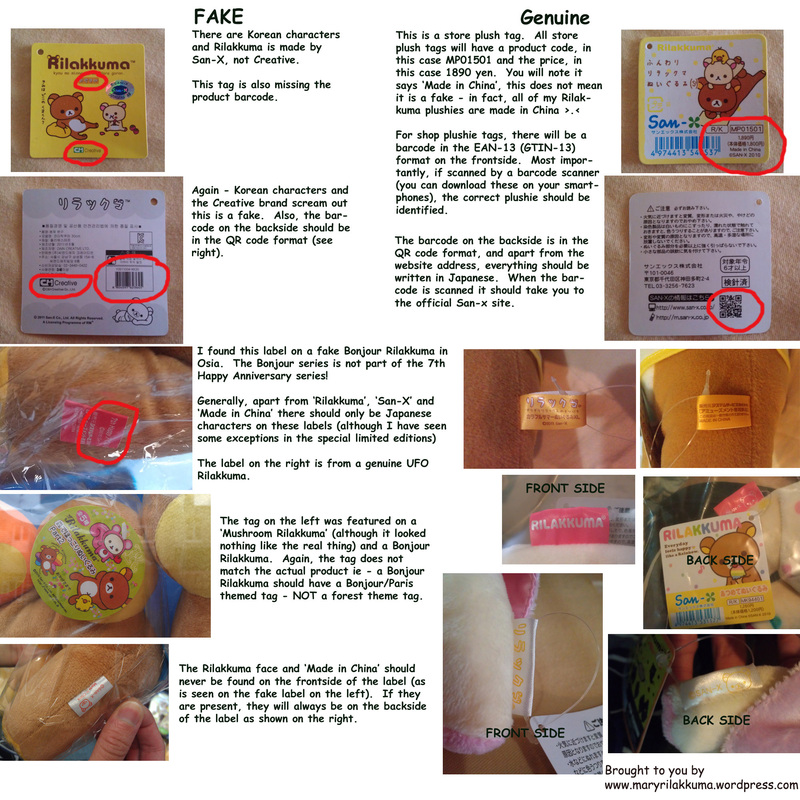 Here is a post update to my previous post A World of Fakes… where I discussed tips on how to distinguish genuine San-X Rilakkuma plushies from the fake ones. I’ve received numerous positive feedbacks on my previous guide so I’m very happy Rilakkuma fans have found it useful! Recently I received a pleasant email from one of my blogreaders requesting help on authenticating Rilakkuma plushies from an online Indonesian shop. The prices quoted are quite high – up to $650,000IDR = $89NZD = $72USD! After looking at the shop’s product pictures, I realized I’ve forgotten to mention something glaringly obvious in my previous post! Pingback: What would you do? | Everyday with Rilakkuma feels happy like a Rainbow! Also, can you tell me if this is fake? 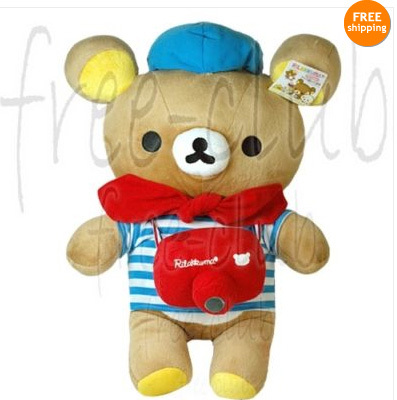 http://www.ebay.ca/itm/Rilakkuma-Apron-Plush-18-5-/220989826165?pt=LH_DefaultDomain_0&hash=item3374052475#ht_500wt_1313 I suspect it is and want to ask for refund, but I don’t want to do so if I’m not certain. >-< Thank you so much!!!! They’re real. They are the UFO catcher version by Fansclub. If the tag is in the ear is it fake? Hi, thanks for reading my blog. Sorry, I don’t answer authenticating questions anymore. Personally i think it’s fake. Note the slightly slanted mouth and the pink ear portions. I have a question, are you able to tell me if my plush is real ? Because it’s very different from the one that San-x offers for their Year of The Tiger ones, yet it looks real. Hi, thanks for reading my blog. Sorry, I don’t answer authenticating questions anymore. I hope you can understand. Hi this is not a authentic question but this is just about a question about fansub Rilakkuma. Is Fansub Rilakkuma official San-X Plush? Or do they work together to make the plush? Like Fansub do the design and tag then San-X do the plush. Hi, do you mean fansclub? Fansclub designs and releases arcade rilakkuma plushes every month, like the ones you see in the UFO catchers. These are not like the store plushes, which are designed and released by san-x once every 2-3 months. Hope that helps. I have a question – my Rilakkuma fits all the categories for the real Rilakkuma but instead of the Rilakkuma head on the ribbon tag on the leg, my Rilakkuma has a cherry ( and the sanx logo ) on the ribbon tag on the leg. Does that still mean my Rilakkuma is real? you totally need to check out this shop in bugis+ the rilas in the shop all match what you identified. looks pretty fake and all the faces out of shape. however i did see a shop in bugis junction that sells the authentic one according to you cause the staff still showed me their catalogue and the material of the rila is so obviously real!!!!! I got them from shop kawaii. hello! just wanted to say thank you for this wonderful and helpful guide. I purchased Rilakkuma plushes recently and verified that they were authentic with the help of your post! I would also like to thank you for your work here, Mary. I bid on my first Rilakkuma BEFORE I had discovered your blog back in early August of this year. (I’ve only been acquainted with RIla and his friends since this past July). However, I was EXTREMELY lucky that the plush I bid on is, in fact, genuine. There were about 3 days left for the auction to close, and I came across some sort of article somewhere discussing counterfeits. That certainly made me panic. Further searching led me to your blog and these posts. Having this knowledge due to your posts, and being able to enlarge/zoom in on the photos of the listing I’d bid on helped me confirm that everything about him was genuine. This plush no longer had his card stock tag, however, his leg tag was legit! I only had to pay $31.00 USD upon winning the auction, including shipping. The information from this post continued to help me with determining if the few other plush purchases I have been able to afford since then were genuine, as well. Anyway, I hope you enjoy your Rilakkuma and that he brings a smile to your face every day :)) Take good care!!! Hello if I were to buy a rilakkuma plush on a Japanese site called Rakuten would those plushes be fake too? Hey, if I’m not mistaken, Rakuten is a Japanese e-commerce site featuring various sellers/businesses. I would say ‘generally’ they would be genuine, but I would still check the product pics/description carefully before buying and assuming everything sold is genuine. Thanks so much for this invaluable advice. Part 2 definitely saved me from buying fakes on eBay. this very helped i got my first one from a friend tat just went to japan and while i was reading it my rilakkuma is authentic but is the tags always square want to know for future preference, hope u can answer. Hi Daria, are you asking whether all tags on authentic plushes should be square? Most tags are, but there are exceptions. For example, for the sweets series the tags are shaped like cakes. 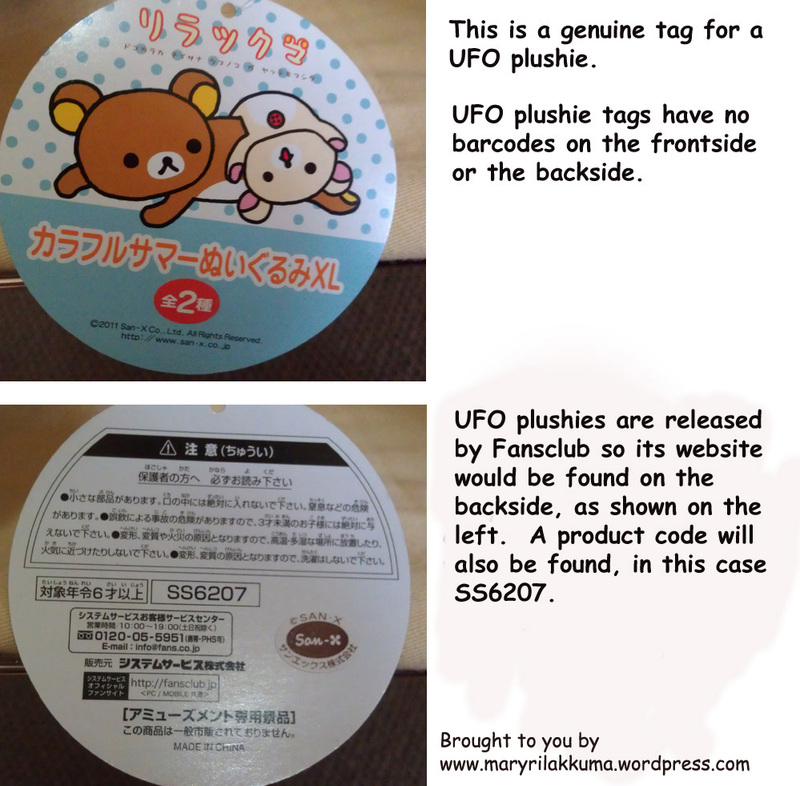 Also, for the UFO ones, the tags are circular. So not all tags are square, but most are. Hope that helps. Hi, thank you for your kind words 🙂 I’m glad you’ve found my site helpful. 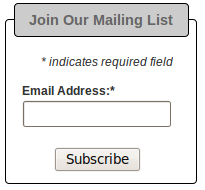 Sure, I am happy for you to link my site. Hi!! I love Rilakkuma so I really appreciate you share with us your knowledge. I hope you can help me with this. I bought a korilakkuma squirrel plush but on the tag it says “creative”. I already talk with the seller but she said that’s because it’s the corean version. Is that true?? If not, Is there any san-x site where it says about these fake plush??? Thanks a lot for taking your time to read my question, even if you can’t answer me. Hello, yes, that is correct – there are HK and Korean versions, but I don’t collect those as they are not the official “Japanese” version even if they are producing the plushies legally. They look different from the original San-x ones – usually the quality is not as good. Hope that helps! Hello, I find your blog helpful and I looked at my Rilakkuma things. Some of the real things is on it as well as the fake things(I hope I am just reading it wrong) I can’t tell Japanese characters from Korean Characters. Quite confusing. Thank you so much~!!! You are so sweet. You’re welcome! 🙂 Enjoy your cutie pie! Tks! I haven’t seen this kind of site before and I’m always wondering whether my rilakkuma plush toy is authentic ’cause my mum recently went to japan & told me there were these kind of plushies there.So relieved! Hi, I’ve read your post. I’m planning to buy a Rilakkuma now but the tag is punctured in the ear. I once saw a post where someone said it is a fake. But comparing to what you had posted, I think it’s genuine. I really dont know. Can you help me? Hi, as my guide said – generally if the tag is punctured in the ear it is fake. Hope that helps! Here is a picture of what the tags should look like! Actually, you’ve just given me a good idea! 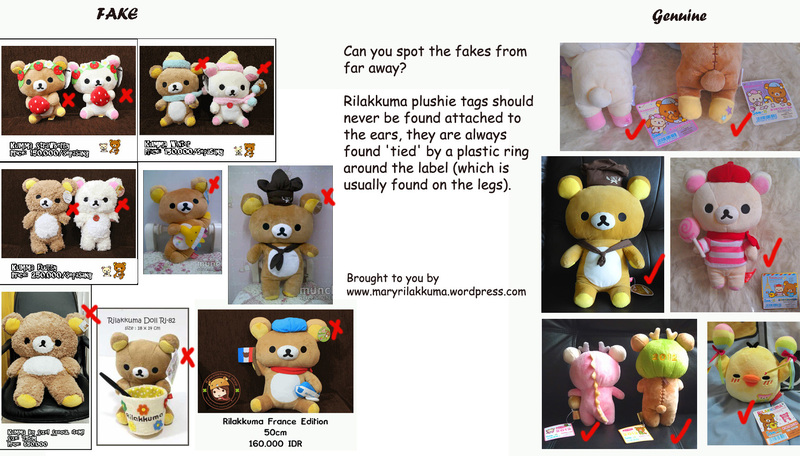 To help Rilakkuma fans differentiate between fake vs authentic Rilakkumas, I could upload a gallery of Rilakkuma tags! ^-^ They are also very cute to look at! I’ll look into doing that some time 😛 all my Rilakkumas are in bags and have been strategically stacked for display so I’m a bit lazy in terms of taking them down/out of bags/take photos etc, but yes! good idea indeed! Anyway, hope that answers your question! Thanks for your reply. Actually I mean the design of the plushies. Are there circle tags also? Oh? Check out my Rilakkuma gallery and you’ll see their design. And no, no circle tags! Just square ones. Definite fake! You can tell from just looking at the plushie itself, the tag on ear is another dead giveaway! Hope that helps! And with that price tag too! Yea – so far, the tag on ears thing has not failed me yet 🙂 but I didn’t need that clue to tell that it’s fake. Fake. I can give lots of reasons… But if you had taken the time to read my guide, you’d see the most obvious wrong here is that the tags are attached to the ears (amongst not looking like Rilakkuma at all). Hope that helps! 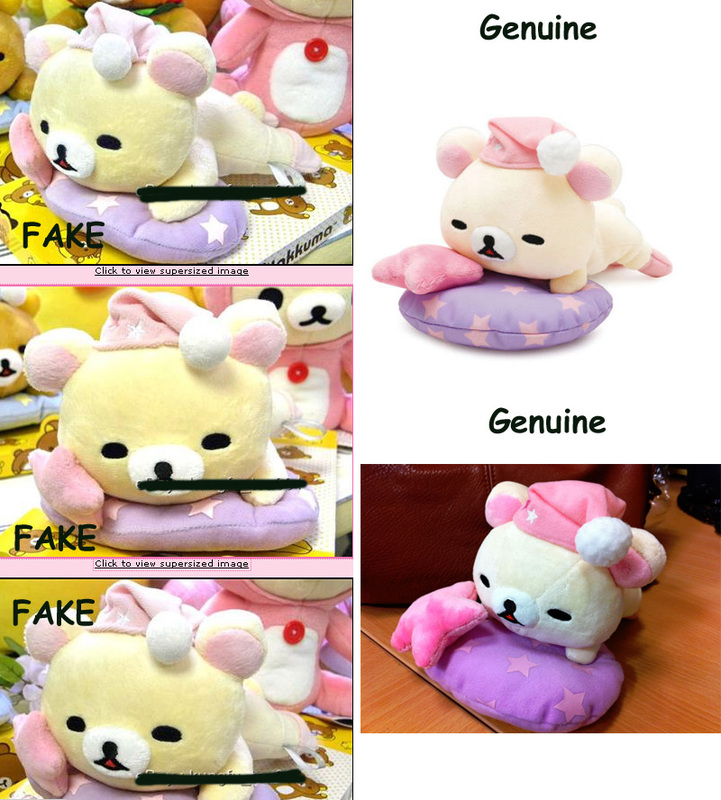 if it is a fake, do you have a legit online place to buy real Rilakkuma? do stores ever say they are real and then send me a fake? awww that would be sad like when you found out yours were fake. Hi, thanks for visiting my blog. Shopkawaii sells authentic Rilakkumas. Please note, I’ve written under https://maryrilakkuma.wordpress.com/where-i-buy-my-plushes/ that I don’t give out advice on where to buy Rilakkuma products. Thanks and good luck! I never see something like this.. but it’s tag look real.. please help me..
Hi, fake. By the way, if you read my guide, I have a disclaimer at the start where it tells you that I don’t answer authentication questions. Ok… Well, please make that the only one. I wrote the disclaimer for a reason so please respect that. Is this an okay site to order from? I just started collecting and I’m scared to buy fakes. Hi, sorry, I’m not sure which site you are talking about? I am trying to find a rilakkuma iphone 4 case for the my sister, because shes been begging for about a year now. But when I’m searching on Amazon, I just don’t know which one to get. A lot of them are detachable, which I know are fake. I know this is late, but please can you help me? Hi Kim, sorry I no longer collect Rilakkumas so I can’t help you there. Best wishes. 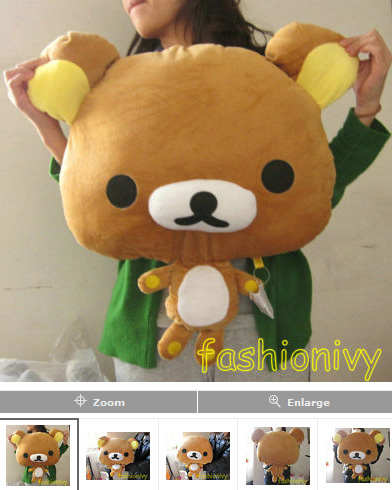 We sell authentic Rilakkuma products, and I agree with you that the quality is far superior.